From a Doctor Who-style TARDIS bathroom to an, ummm, "motion-activated," baseball-themed urinal, America's smallest rooms are up for the biggest prize as part of this year’s Best Restroom contest. The competition, sponsored by restroom service company Cintas, is in its 15th year of finding unusual, creative — and frequently over-the-top — loos; and asks the public to vote on which one should be crowned the best throne. “Over the last 15 years we’ve identified 150 finalists throughout the United States with exceptional restrooms,” said John Engel, ‎Director of Marketing, Facility Services at Cintas Corporation. 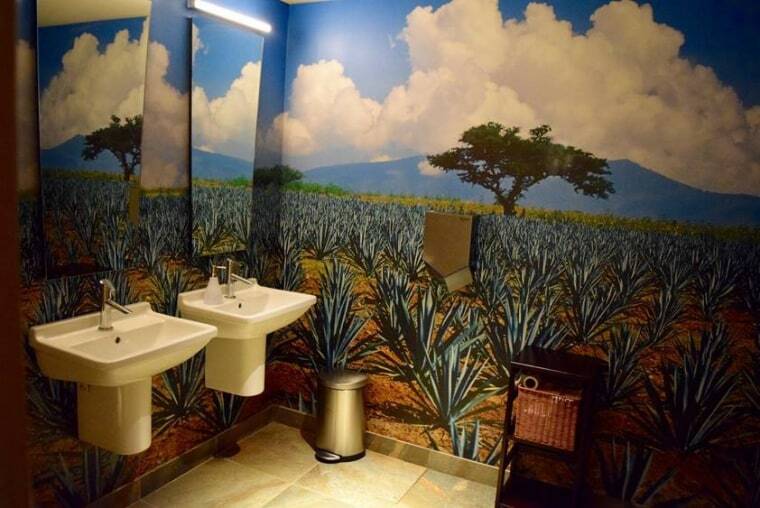 This year’s list of finalists includes Lena Brava restaurant in Chicago, where the colorful agave-themed wallpaper makes patrons feel as if they’re in a field in Mexico instead of in Chicago’s West Loop; and a multi-year program to renovate more than 100 sets of restrooms at Minneapolis-St. Paul International Airport with artist-made mosaic inside and outside, plus waiting areas with flight information and art displays. “At airports, restrooms are often the first place travelers visit when they get off a plane and the last place they visit before they board, so it’s important they are not only functional but also make a good, lasting impression,” said MSP Airport spokeswoman Melissa Scvronski. Also on the list: the Novel Neighbor bookstore in St. Louis, Missouri, which has restrooms papered with pages from classic old books; and the Doctor Who-themed TARDIS bathroom at the Way Station bar in Brooklyn, New York. At the Safe House restaurant and bar in Milwaukee, Wisconsin, the espionage theme includes large unblinking eyes on the back of the men’s room stalls and a panel in the “UniSexy” room that allows those in-the-know a secret vantage point of the bar. “This can be to ensure that your date doesn't stray while you are away,” said Christine Williams, the restaurant's "Chief of Disinformation." And then there’s Coca-Cola Park in Allentown, Pennsylvania, the home of the Lehigh Valley IronPigs minor league baseball team where there’s a motion-activated urinal game in the men’s restroom. A motion-activated urinal game is the big play in the men’s restroom at Coca-Cola Park in Allentown, Pennsylvania. The full list of entries in this year’s America’s Best Restroom contest can be viewed and voted on online through November 2. The owner of the winning loo receives $2,500 of Cintas service and products and first-plaques for the restrooms. And, just as with the presidential election, your vote counts.